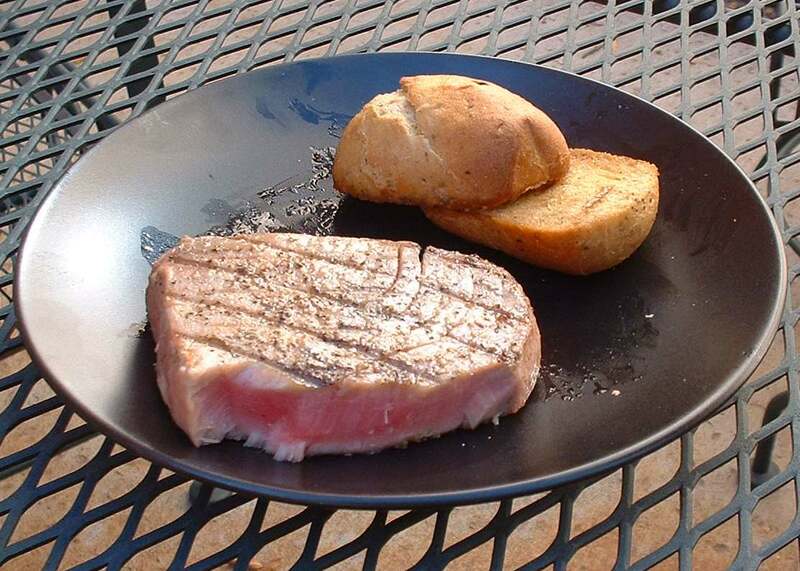 Anticipating a nice easy Saturday grilled lunch, that morning I coated the tuna with some sesame oil, garlic, black pepper, and brown sugar, and put it in the fridge to come back out in a few hours. Well, Saturday was busy. We weren’t home at all. As soon as I got off work, I started the charcoal briquets and began the final phases of the anticipation process. Then I just seared the steak for about 3 minutes on each side, pulled it off the grill, and was happily savoring the ahi within a minute’s time. Mmm, sooo good! I’ll come straight out with it: I think single-malt scotch whisky is the most perfect, most divine, most satisfying distilled spirit to ever grace this planet. My “Bachelor (un)Party” centered around tasting and educating myself with a range of scotches… in moderation over a period of many hours, of course! I’ve had a sentimental attachment to certain distilleries’ offerings since then. One of my favorites is Oban, a potent whisky from the Western Highlands distilling region in Scotland. West Highland scotches tend to have an earthy/peaty quality in the aroma, and a taste that starts off sweet and leaves you with a dryish, peppery finish. A related single-malt is Talisker, about which someone said, “Talisker is not a drink, it is an interior explosion, distilled central heating; it depth charges the parts, bangs doors and slams windows. There’s nothing genteel about Talisker.” Wheee! So last night, I said goodbye to my beloved bottle of Oban, finishing its last ounces off in a side-by-side comparison with a new single-malt that I picked up with some birthday money, a Glenfarclas. Below are my tasting notes, taken with assistance from a great site, scotchwhisky.com. Fawnridge Winery made the Zinfandel and Chardonnay that we had at our wedding. Anina and I kept a few bottles of the Zin because it was just so good, and because it has a custom label made just for us (ok, maybe the sentimental attachment and the label are the primary reasons). For the past year, we’ve had 2 bottles here at the apartment, on display in the kitchen as decoration. The plan was to open one on our anniversary, but I ended up with an intestinal virus woohoo! We had already brought home the bottle of Copolla Shiraz that I blogged about last time. So anyway, I was healthy for Saint Valentine’s Day, and I whipped up some pasta and red sauce with Italian sausage. Of course, that calls for red wine! I think this may be the oldest bottle I’ve ever had… that sure shows my wine (in)experience, eh? But this zinfandel fulfills the oft-misinterpreted adage about wine getting better with age. In 50 years, it will supposedly taste like vinegar, but at press time, it is primo. This entry has been a saved draft for a couple weeks, and now I’m finishing and posting it. At our anniversary dinner we ordered a bottle of a sentimental favorite, a 2004 Shiraz bottled by Niebaum Estate (formerly the Coppola-Niebaum Estate Winery). Normally I’m suspicious about celebrities getting into fields like wine-making and whatnot (cough cough Greg Norman cough cough), but hey, it’s Francis Ford Coppola. I think the man behind the Godfather trilogy might know a thing or two. Well, actually, I can tell you he does.